Oil on panel, 13,5 x 10,5 cm. Ovalt. 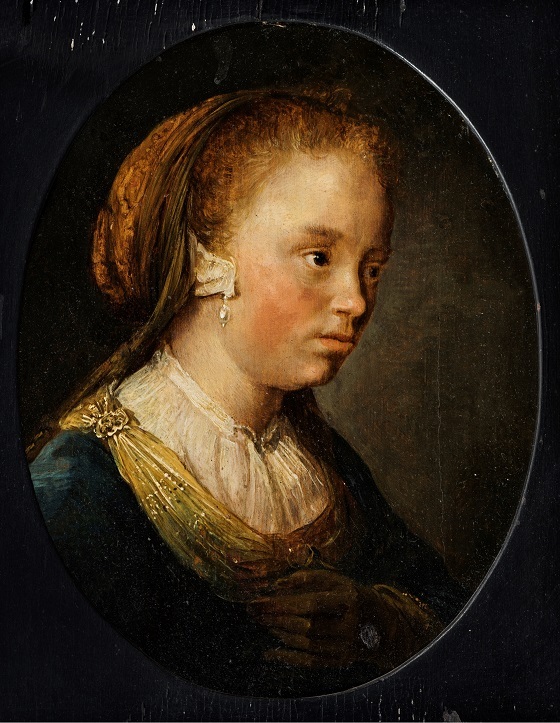 Painted by the Dutch painter Gerrit Dou, the portrait depicts a young and somewhat morose girl with brown eyes, reddish-brown hair and a musing expression on her face. She keeps her gloved left hand in front of her blue bodice, on top of which a yellow scarf can be seen. A similar scarf in a tan colour hangs down from the girl’s white headdress while a frontal light illuminates the folds of her dress and her pale skin. Gerrit Dou was a student of Rembrandt, and is especially known for his carefully painted small genre scenes. Much of the artist’s acclaim stems from the thorough attention to detail that his works are characterised by. The scenes often consist of fine brushwork and clearness down to the tiniest of details.